Trippier hoping that squad stays intact! Defender Kieran Trippier is hopeful that the bulk of the Clarets squad will remain intact following relegation from the Premier League. Sean Dyche’s men were condemned to a premature return to the Championship despite beating Hull City at the KC Stadium at the weekend. Leading scorer Danny Ings, who netted his 10th goal of the term against the Tigers, Michael Duff, Dean Marney, Ross Wallace and Steven Reid will all see their contracts at the club expire this summer. “There’s a lot to think about during the summer,” he said. “Obviously you don’t want to lose your key players. “We’ve got a great squad, a great manager and great staff. Hopefully we can keep it all together. We’ve got a great squad, great manager and great staff. Hopefully we can keep it all together! 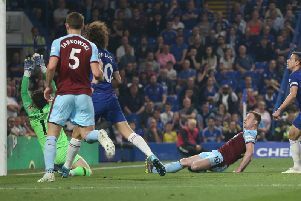 The Clarets set a record-breaking club total of 93 points in the Championship last season, but Trippier acknowledges that another tough challenge lies ahead. “We knew it would be difficult coming into this league, with the money that’s been spent by other clubs,” he said. “We gave everything in every game and we’d love to have taken more points than we’ve got now but that’s the Premier League. “We’ve had a great experience this year because not many players in our dressing room had played in the Premier League before. “The Championship is a tough league to get out of – we found that last year and the year before. The 24-year-old, who has featured in every league and cup contest this season, is contracted to the club for another two years, but he refused to look to far in to the future just yet. Trippier said: “I just want to play football, that’s the most important thing. Meanwhile, the one-time England Under-21 international is eager to reward the fans with another victory before the curtain comes down on another campaign. With games against Stoke City and Aston Villa on the horizon, he said: “They’ve been great all season. From game one against Chelsea until now, even when we’ve been through tough times. “We didn’t get a win for the first ten games, they were always there. “They were magnificent at Hull like they have been all season. “Hopefully, we can get two more wins. We’ve got two more games left and we’ll go into them to win, of course.